Road Rules – Turning left: Is it OK to wait in the intersection? It’s the dreaded 5 p.m. commute, and you need to make a left turn onto a busy street. After waiting through a couple of lights, you’re at last poised to make your turn. 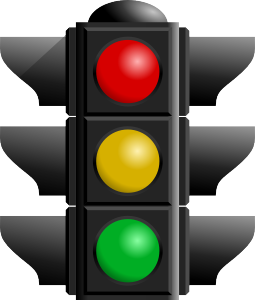 Skip it altogether, because you realize the traffic light doesn’t have a green turn arrow? There’s a reason 70% of would-be drivers miss that question on the Washington drivers test. Many of us do it wrong! To meet the letter of the law, you should not enter the intersection unless you know you can complete your turn. Why? You risk blocking the intersection if the light changes and the lane into which you are turning remains clogged (or becomes ​clogged by people taking right turns) and there’s no room for your car. However, NOT going into the intersection can trigger road rage by people behind you. But stand firm and do the right thing! Adapted from Pemco Insurance’s newsletter. 5 comments to Road Rules – Turning left: Is it OK to wait in the intersection? This sounds ideal but we would never make it through many intersections if drivers didn’t violate the law. Try going south on 35th Ave NE and turning left on NE 125th towards Sand Point. Literally one car per light cycle will make it through and that’s only if they break the law. If they were to wait and not enter the intersection until they could pass through we would all literally be there for a few hours until traffic died down. I mostly agree with the law but choose willingly to break it. If SDOT wants to address the massive growing congestion in our region and put money into fixing these problems that would be very helpful – as in traffic studies to understand why every person going through that intersection must break the law to get through it. Sadly I don’t have any hope that SDOT will address the growing issues of traffic in our neighborhoods. All this requires is that there is sufficient space in your destination lane to accommodate your vehicle. As long as you can complete your left turn (when traffic is clear), then you are upholding this law, even if you scoot out in preparation for your left turn. In a busy intersection there’s no guarantee that you will be able to complete your turn by the time the light turns red. At that point, stuck in the intersection, you will risk getting a ticket. The law doesn’t say anything about being able to complete your turn; only that you have sufficient space to make it. If you have concerns that you won’t make it, then of course you shouldn’t creep out. However, the statement “Enter the intersection only when you see you can make the turn without having to stop” is not what the law states. Hm. I think the only inaccuracy in the post is the wording WITHOUT STOPPING in ‘you should not enter the intersection unless you know you can complete your turn WITHOUT STOPPING’. The law doesn’t say you can’t stop. You just can’t obstruct traffic in the intersection like you would if you got trapped in the intersection before you made the turn.